On 4 July 2016 the NASA spacecraft Juno will arrive at Jupiter after a 5 year journey. It will be the ninth space probe to visit the planet. The first was Pioneer 10, which flew past in December 1973, (see notes). 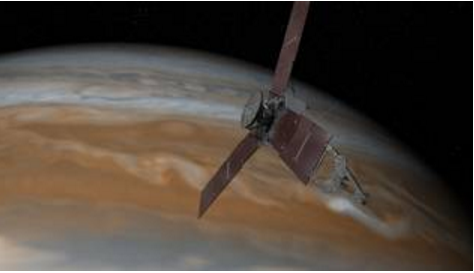 Juno will go into an orbit around the planet which will take it close to its poles. It will remain in that orbit until the end of the mission when it will be deliberately steered into Jupiter so that it can take measurements as it descends through the atmosphere. It will be destroyed by the intense temperatures and pressures, but the alternative would just be to leave it in orbit forever as a dead spacecraft, missing the chance for it to find new scientific information as it makes its final descent. As nearly all my readers will know, Jupiter is the largest planet in the Solar System. Its diameter is on average 140,000 km which is roughly 11 times that of the Earth, making its volume 1320 times larger (Williams 2016). Unlike the inner planets (Mercury, Venus, Earth and Mars) which have large iron cores surrounded by rocky materials, Jupiter is mainly composed of gas. It is not known if it has a solid core, but if one exists it will only make up a small proportion of the planet. Being made up of largely of gas means that its density is only 25% that of the Earth. Even so, its mass is still 320 times greater, making it more massive than all the other planets, moons, asteroids and comets in the Solar System put together. It has a magnetic field which is 15 times stronger than the Earth’s and extends millions of kilometres into space. The magnetic field traps electrically charged particles so that they are confined into a ring-shaped structured around the planet. These trapped particles emit electromagnetic radiation. This causes Jupiter to be surrounded by deadly radiation belts, which would be lethal to any space travellers who ventured too close to the planet. It has its own mini “solar system” of over 60 moons in orbit around it. The four largest moons were discovered by Galileo in 1610 and one of them, Ganymede, the largest moon in the solar system, is bigger than the planet Mercury. The innermost moon Io is the most volcanically active object known to exist anywhere. Europa, the second innermost, is of particular interest because its surface is composed of ice underneath which are thought to lie oceans of liquid water, warmed by a process called tidal friction. Many scientists think that Europa is one of the most promising places in the Solar System to find extraterrestrial life. Unfortunately Juno will not be studying Jupiter’s moons. However the European Space Agency (ESA) is planning a mission called JUpiter ICy moon Explorer (JUICE) to study Europa, Ganymede and Callisto. A microwave receiver which measures radio-waves with very short wavelengths knows as microwaves. 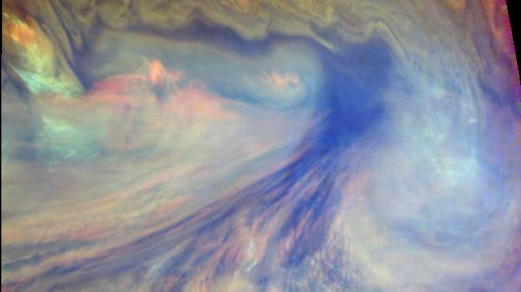 These are the only waves able to travel through the thick atmosphere on Jupiter. This instrument will measure the abundance of water and ammonia and the temperature profile in the deeper layers of the atmosphere, up to 600 km below the top. An instrument which can take pictures in infrared which will be used to map regions of high temperature known as hot spots in the top of the atmosphere. A magnetometer to accurately map Jupiter’s magnetic field. An instrument to measure small fluctuations in the probe’s speed and direction of travel as it orbits. The small fluctuations are caused by unevenness in Jupiter’s gravitational field due to the way that mass is distributed inside the planet. A visible light camera/telescope called Junocam. This is only expected to survive seven orbits around Jupiter because of the planet’s damaging radiation and magnetic field. Instruments to measured charged particles near the poles of Jupiter. The planet Jupiter is named after the Roman king of the gods. 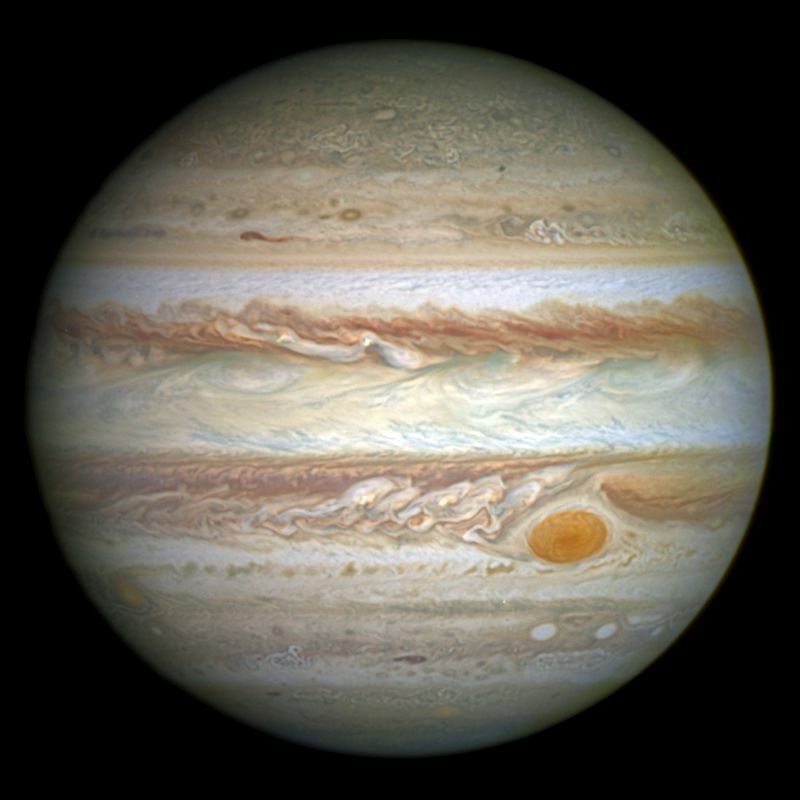 In Roman mythology, Jupiter drew a veil of clouds around himself to hide his mischief. Jupiter had a wife, the goddess Juno, the warlike queen of the gods. 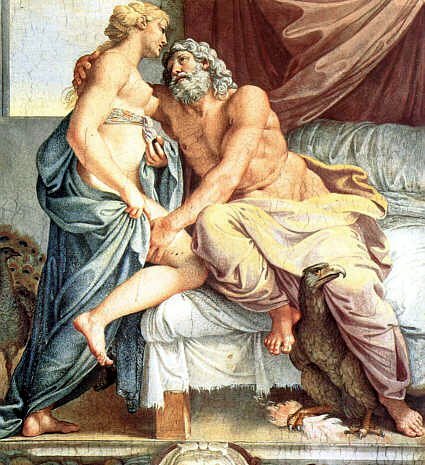 According to legends Juno was able to look through Jupiter’s clouds and see his true nature. How much has Juno cost? Missions to other planets are expensive and this is no exception – so far the spacecraft has cost $1.1 billion (Lufkin 2016). Most of this was spent before its launch in 2011. The total cost in 2016 dollars will be around $1.3 billion. Although this is a large amount of money, it only works out at about $4 for each person in the US and is less than 1% of the cost (in 2016 dollars) of the Apollo programme to put a man on the Moon. 1 The following spacecraft have visited Jupiter: Pioneer 10 (1973) shown below, Pioneer 11 (1974), Voyager 1 and Voyager 2 (both 1979), Ulysses (1992), Galileo (1995-2003) Cassini (2000), New Horizons (2007). Galileo spent 8 years orbiting the planet; the other spacecraft flew past the planet on the way to view other targets. Lufkin, B. (2016) NASA’s Juno Spacecraft Is Scheduled to Arrive at Jupiter on July 4, Available at:http://www.scientificamerican.com/article/nasa-s-juno-spacecraft-is-scheduled-to-arrive-at-jupiter-on-july-4/ (Accessed: 25 June 2016). NASA (2016) Juno Overview, Available at:http://www.nasa.gov/mission_pages/juno/overview/index.html (Accessed: 16 June 2016). Williams, D. R. (2016) Jupiter Fact Sheet, Available at:http://nssdc.gsfc.nasa.gov/planetary/factsheet/jupiterfact.html (Accessed: 14 June 2016). Thank you for refreshing my memory of that great mission to Jupiter. Magnificent post. I remember when Sputnik 1 was launched. Now, here we are. Timely post to tweak my awareness. Thanks. Was very pleased to see this blogpost. Thanks for posting. You always have the most interesting posts and I enjoy them all. Thank you for your kind comments. Hopefully we’ll see some interesting results from Juno.